Save with mail-in rebates on select ambition™ sewing machines, including the new quilt ambition™ 630! receive a $200 Instant Rebate with purchase of the coverlock™ 4.0 overlock machine or a $100 Instant Rebate with purchase of the coverlock™ 3.0 overlock machine. Plus, receive the following INSPIRA™ Presser Feet Kits for FREE with the following purchases (up to a $391 value)! 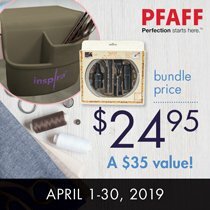 For a limited time, save $10 when you purchase the INSPIRA™ Catch-All and INSPIRA™ Mini Vac Attachment Set for only $24.95!